Notes: Q2 2015 was “pretty good,” declares Monetate, noting overall increases in conversion rates, average order values and revenue per session on a global basis, though bounce rates also increased. Also of interest, average order value for visitors referred by social networks grew each quarter during the previous year, but still lagged direct, email and search. Within the US, smartphones’ share of e-commerce visits increased again; however, these devices continue to trail tablets and desktops in conversion and add-to-cart rates. 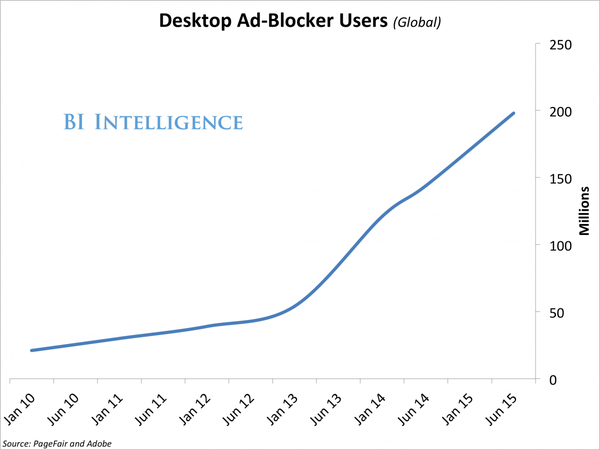 Ad-block software usage may be more common than previously thought. There are nearly 200 million monthly active users (MAU) of ad-block software globally, according to data from a new study by PageFair and Adobe included in our latest ad-blocking report. That represents a big uptick in ad-block usage from just one year ago. The software, which blocks ads from appearing on websites, search, and social networks, is also catching on in the US. Ad-block MAU totaled 45 million in the US as of June 2015, increasing nearly 50% from last year, according to PageFair and Adobe. In this report, BI Intelligence looks at ad block usage rates, Apple’s newest ad block software and how it could make ad blocking more common on mobile, and examines solutions for publishers. There are several solutions that publishers can use to combat the growing ad-block problem, including education, technical solutions, and micropayments. Which solution publishers should opt for can be determined by their particular ad-block usage rates. Ad blocking poses a major threat to digital media companies that depend on advertising for revenue. If ad blocking on mobile reaches desktop levels, US digital media companies could lose out on as much as $9.7 billion across digital ad formats next year, according to BI Intelligence estimates based on current usage rates. Ad-block usage rates vary greatly depending on content type and audience demographics. Publishers whose audience skews toward young males, such as video game sites, tend to see much higher ad-block usage compared with general news sites. Ad blocking may become even more common with the release of Apple’s widely used desktop and mobile operating systems later this year. The operating systems will feature a framework that makes it significantly easier for developers to create ad-blocking software, particularly on mobile. Ad blockers typically use one of two methods to prevent ads from loading. In most cases, ad blockers prevent the loading of digital ads that are served by a list of known ad servers. Blocked ads typically include display, video, social, and search ad units that appear in web browsers. To access the full report from BI Intelligence, sign up for a full-access 14-day trial here. Full-access members also gain access to new in-depth reports, hundreds of charts, as well as daily newsletters on the digital industry. What Causes Consumers to Lose Trust in Digital Brands? Notes: A majority (56%) of US smartphone owning adults have abandoned a mobile transaction, according to Jumio, though this figure is down from 66% in a similar survey conducted in 2013. Among those who have abandoned a mobile transaction, purchase uncertainty (45%) was the top reason cited, followed by slow load times (36%) and difficulty with navigation (31%). These usability concerns appear to outweigh security concerns around payment (27%) and personal (26%) information, per the survey’s results, though other research suggests security con! cerns ar e still prevalent. drag2share: Which Device Would You Miss the Most? 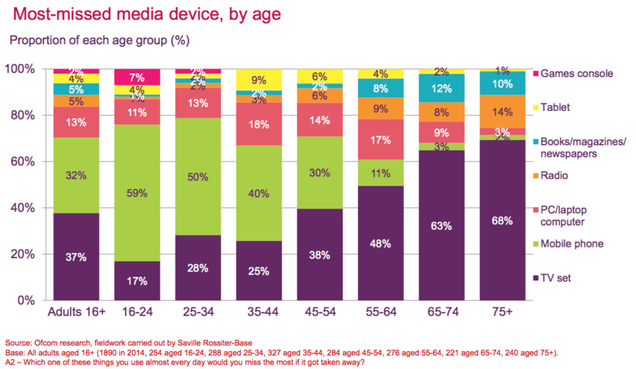 According to a detailed study from Ofcom, the UK version of the FCC, different generations have vastly different attachments to internet devices: the grandparents can’t live without the TV, and (surprise surprise) you’d have to wrest the smartphones from millenials’ cold, dead hands. Earlier this week, Amazon confirmed it was shutting down its pay-per-click “product ads” that showed links and photos at the bottom of search results and diverted traffic out to other sites. Product ads were popular among e-commerce brands because the format allowed them to partner with Amazon, but without Amazon seeing their transaction data. Ad sellers like Google were able to use the ads to get information about Amazon’s users, which enabled them to hone up ad targeting on their own platforms. Amazon is now plugging that hole, which was allowing hundreds of companies to essentially steal chunks of its online advertising share by using its own data (for a price.) Now brands that want to advertise their products on Amazon.com will be pushed towards selling their ads on Amazon.com too. Amazon is offering an olive branch for those that still want to link out of Amazon.com to their own sites by testing “text ads,” but as the name indicates, these won’t offer the imagery that is more likely to capture users’ attention and will be less of an attractive offering to retailers. According to analytics company Similarweb, Amazon sent 3.4 million desktop visits to Google.com ads over the past six months (February to July) in the US. That might, on the surface, seem like just small change to Amazon: outgoing visits to Google.com are less than 0.1% of the total 4.5 billion US desktop visits to Amazon.com over the same period. But each of those 3.4 million visits provided Google with valuable data. By shutting off outside access, Amazon’s move is in-keeping with a wider trend of platforms building up “walled gardens” around their advertising technology stacks. Earlier this month Google confirmed it was restricting marketers from buying YouTube ads via third-party companies through the DoubleClick ad exchange.